This interesting name is of Anglo-Saxon origin, and is in most cases a locational surname deriving from one of the places called Heathcote, such as those in Derbyshire and Warwickshire. The place in Derbyshire is recorded in the Domesday Book of 1086 as "Hedcote", and as "Hethcote" in 1244, while the place in Warwickshire appears as "Hethcot" in the 1196 Feet of Fines for the county. Both places share the same meaning and derivation, which is "the cottage on the heathland", from the Olde English pre 7th Century "haeth", heathland, heather, with "cot", cottage, dwelling, sometimes a shelter for animals or their keepers. 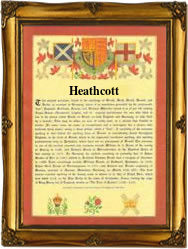 The modern surname, found as Heathcote, Heathcott and Heathcoat, may also be topographical in origin, from residence by or at such a heathland cottage. Locational surnames were developed when former inhabitants of a place moved to another area, usually to seek work, and were best identified by the name of their birthplace; while topographical surnames were among the earliest created, since both natural and man-made features in the landscape provided easily recognisable distinguishing names in the small communities of the Middle Ages. The surname development since 1166 (see below) includes, Ralph de Hethcote (1273, Devonshire). An interesting namebearer, recorded in the "Dictionary of National Biography", was Sir Gilbert Heathcote (1651 - 1733), who led a distinguished career, as among other positions, chief founder of the New East India Company in 1693, and Lord Mayor of London in 1710 - 1711. The first recorded spelling of the family name is shown to be that of Godfrey de Hetcota, which was dated 1166, in the "Pipe Rolls of Derbyshire", during the reign of King Henry 11, known as "The Builder of Churches", 1154 - 1189. Surnames became necessary when governments introduced personal taxation. In England this was known as Poll Tax. Throughout the centuries, surnames in every country have continued to "develop" often leading to astonishing variants of the original spelling.